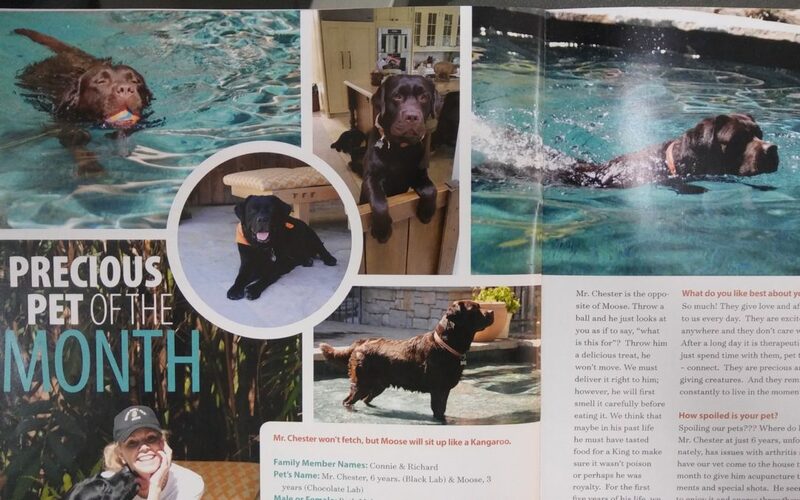 My two English labs, the Moose and Mr. Chester, were recently featured in North of Montana Magazine as the “Precious Pet[s] of the Month.” It’s no secret I’m a proud dog mom, so I thought I’d share the feature with my readers. Enjoy! The Moose, doing a version of his kangaroo pose! Is there a story behind their names? Anything special or unusual about them (talents/quirks)? 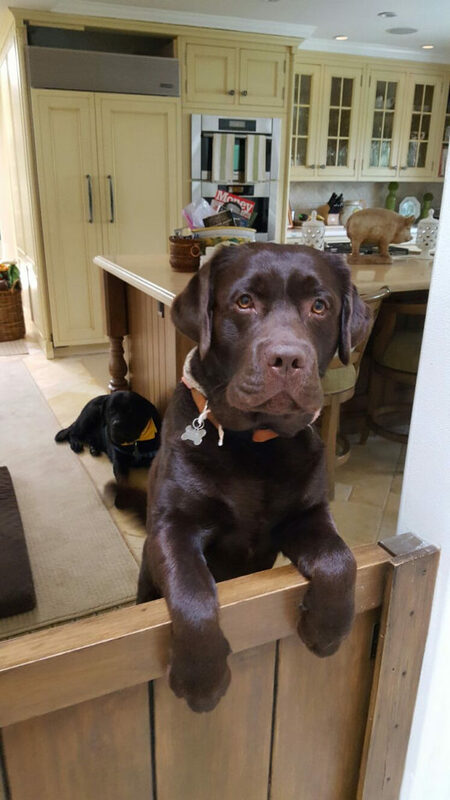 The Moose has this unusual way of sitting up to get a treat- he resembles a kangaroo or bunny, it’s very funny. If you have seen him, you know what I mean. He also loves to swim after his favorite ball. And this is only after Richard tried so hard to get him to go into the pool. We now regret it somewhat because at 7am he paws the glass doors wanting to go for a swim! Moose is always ready to play, to run, to swim, to work, to go at any time – he needs a giant farm or job to tire him out! Above all, Moose is a very loving, devoted boy. 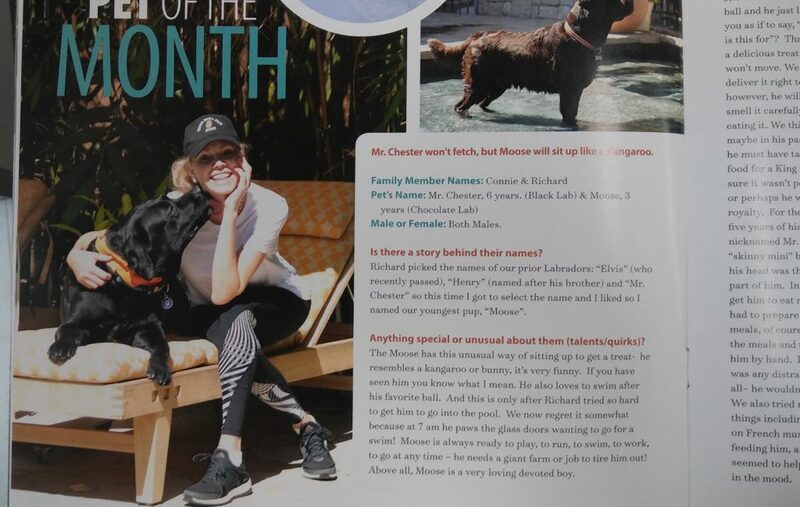 Mr. Chester is the opposite of Moose. Throw a ball and he just looks at you as if to say, “what is this for”? Throw him a delicious treat, he won’t move. We must deliver it right to him; however, he will first smell it carefully before eating it. We think that maybe in his past life he must have tasted food for a King to make sure it wasn’t poison or perhaps he was royalty. For the first 5 years of his life we nicknamed Mr. Chester “skinny mini” because his head was the widest part of him. In order to get him to eat more, we had to prepare special meals, of course vary the meals and then feed him by hand. If there was any distraction at all– he wouldn’t eat. We also tried many things including putting on French music while feeding him, and that seemed to help get him in the mood. So much! They give love and affection to us every day. They are excited to go anywhere and they don’t care where. After a long day it is therapeutic to just spend time with them, pet them – connect. They are precious and giving creatures. And they remind us constantly to live in the moment. 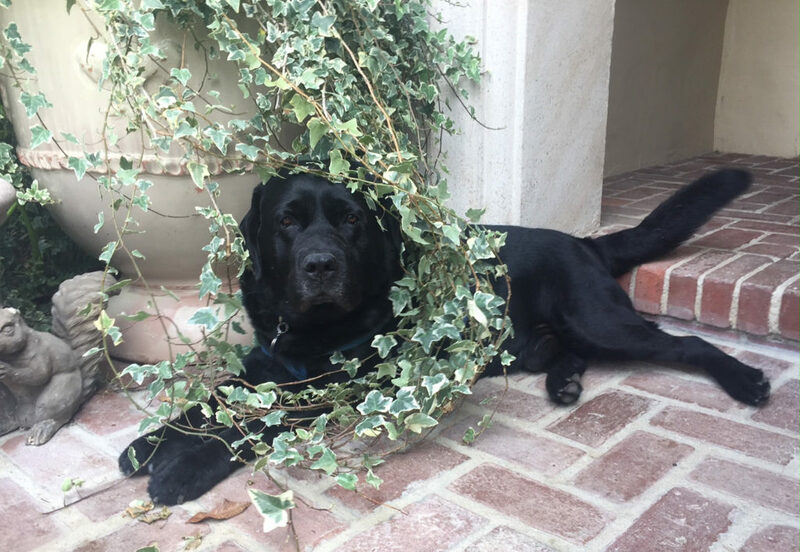 Mr. Chester, doing what he does best – loungin’! Spoiling our pets? Where do I start? Mr. Chester at just 6 years unfortunately has issues with arthritis so we have our vet come to the house twice a month to give him acupuncture treatments and special shots. He seems to enjoy it and snores throughout the treatment. He also gets 2 treatments of hot and cold therapy per day. This may sound extreme or silly but anyone who knows Mr. Chester understands. Both boys go on three walks a day. The Moose begins the day with a good morning swim followed by a walk to the beach and then another swim. He then naps a bit and then is off again on another walk and more play. (Gotta keep this one going all day.) Mr. Chester loves to be outside, so you might see him sitting outside our front door or inside a large green push cart somewhere in the neighborhood. He can’t walk too much so we take him out in the push cart- and it has all the comforts – nice cushy pad, water, treats, some ice packs to treat his elbows and calming music. On a sunny day we even add an umbrella to keep him cool. We also like to travel with the boys They have been to Santa Barbara and Napa many times. We also have a home in the mountains so during the summer we go up there a lot. They love swimming & boating and being outdoors all day. Having them with us is a little more work but it is also gratifying watching them have so much fun. What else should we know about your pet and/or how your pet has enriched your home/family? We try to include the dogs in our everyday life as much as possible. Richard will take them a few days a week to work and we frequent restaurants with outdoor seating as well.